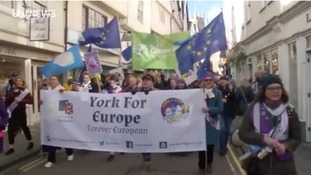 Around 100 campaigners calling for a second EU referendum have marched through York today. The marchers - mainly women following yesterday's International Women's Day - claim Brexit could be a catastrophe for the UK. MPs are due to vote on the Prime Minister's deal next Tuesday. Yesterday Theresa May told a meeting in Grimsby, the UK could be plunged into uncertainty if MPs vote down her deal. It is a claim rejected by the marchers.